Some observations while drip-drying after 4-hours in the rain at Hartford. The weather wasn’t the best but it was far from the worse. Other than chilling down post-race, runners were enthusiastic with being presented a day that actually favored the contestants as opposed to the spectators. Hurrah for NY’s Karen Bertasso! One of the nicer people on the circuit, the Willow St. AC ace’s fastest time prior to today was 2:45:45 run here four years ago. The quest for a trials qualifier has been paramount since. “I was kind of shocked. I ran with Rachel for nine miles and when she took off I was still hitting 6:09s,” commented Bertasso. Even late I was running 6:12-6:15, so at 24 I knew I had it. Anything can happen but I was feeling a great deal of relief.” Karen posted up “in 2:43!” 2:43:46 to be exact, well under the trials qualifier is 2:45:00, so a long journey completed! Red Badge of Courage: Goes to NY’s Kate Pallardy, third behind Bertasso in 2:46:39. A 2:40 trials qualifier in 2016 and 2:44 already this year, Kate badly sprained her ankle running in the Alps and was laid up for three weeks approaching Hartford. She was going to withdraw…and then take it day to day…and on race day she raced, not 100% but game as always. The Mighty Men of Western Mass: it was a great day for members of the Western Mass Distance Project across three races. In the 5K, Ben Groleau, 25, won in 14:54—2 seconds off Dan Vassallo’s 2016 record. In the half marathon, Masters runner Dan Smith overtook NEF 40+ record holder David Bedoya of the BAA on the turn leading under the Soldier’s and Sailor’s Arch with 300m to go. “We were in a group that included Sam Alexander and on a downhill at 10 miles, he and Sam took off and they got 10-12 seconds on me. (Bedoya) slowly started coming back and I was thinking, ‘I might be able to get him by the finish,’” said Smith, who did, in 1:11:52 to Bedoya’s 1:11:56. Bedoya’s previous NEF record set last year was 1:13:18. In the marathon, Dennis Roche ran a 5-minute PR in his second marathon. He’d previously run 2:29 for 4th at last year’s Bay State USATF-NE Championship. Today he crushed it in 2:24:11. Photo: Dennis Roche of the Western Mass Distance Project and NY’s Eric MacKnight. “A” qualifier, Dynamic debut: When we talked to Peru, VT’s David Sinclair two weeks ago, he was psyched coming off a 1:06:12 course record at the Wineglass Half Marathon. We were also high on Ryan Smith of Portland, Maine and how could you not like the kid? He’s 23, working three jobs, with a wife five months pregnant, but still getting it done, placing 10 seconds ahead of previous No. 1 seed Tyler Andrews at the US 20K Championships. (Andrews withdrew with an Achilles problem.) Full disclosure: Smith quit his third job waitering on weekends at a Chinese restaurant in his buildup to Hartford. Sinclair ran solo from 10K after leaving Smith to post up in 2:18:23. Smith ran solo to place second in 2:22:36 after being left by Sinclair. Both fled the elite area before hypothermia set in but we’ll catch up to both for extended coverage in NER. That also includes the half marathon where we talked to an exuberant Annmarie Tuxbury, 24, who concluded her breakout year with a win in a PR 1:14:19 for her biggest payout to date. Photo: David Sinclair and Flyin’ Ryan Smith. 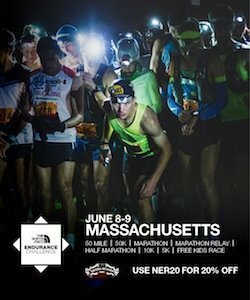 Momentous Women Masters Showdown: We cannot conclude without mention of the throwdown we predicted in the Sept/Oct issue of NER when we stated Hartford would have the best Masters women’s field in the history of New England marathoning. Even with Whirlaway’s Christin Doneski having to withdraw with torn foot ligaments, and two-time defending W40 champion Leslie O’Dell running with “stiff legs” it took a top-10 sub-2:55 performance from CT’s Shannon Siragusa, 43, to take the lead from RI’s Karolyn Bowley, 49, in a late charge. Photo: Top Master Shannon Siragusa. Siragusa caught Bowley right under the Arch to fashion a 4-second victory in 2:54:57. When we hit Bowley with an “Ouch!” she responded with a laugh. “No, it’s all good, what a race, we both PR’d.” And Bowley at age 49 as the duo placed 7-8 in a loaded women’s field. Yowza! Also: Taconic Road Runner Greg Diamond, 61, crushed Dr. Steve Reed’s NEF M60 record of 3:33:04 set in 2010. Despite “aching quads from 17 on” Greg finished in 3:15:53! Previous RI’s Sisson Sizzles at Reebok Boston 10K For Women – Battle Road TC Top Team Over B.A.A.